At 5:30 a.m. every weekday morning, Jordan Young enters the hospital room of his five-month-old daughter, Jett, at Mayo Clinic Hospital, Saint Marys Campus. He stays just long enough to give her a kiss before walking to his car and driving to work in the Twin Cities, about 80 miles to the north. Jett's mom, Katelyn Young, takes over from there. "I'll walk to the hospital and just sit in her room with her," Katelyn says. "Depending on what's going on for the day, she might be sleeping, or she might be having a chest X-ray done, so I'll just sit there and chat with her nurses." After work, Jordan drives back to Rochester to be with his family. "We'll stay at the hospital with Jett until around 8 or 9 every night, depending on what she's been through that day," Katelyn says. At the time of Jett's birth, Katelyn tells KARE 11-TV News, nothing seemed out of the ordinary. "She was born perfect," Katelyn tells the station. Twelve hours later, however, Jett's oxygen levels dropped. 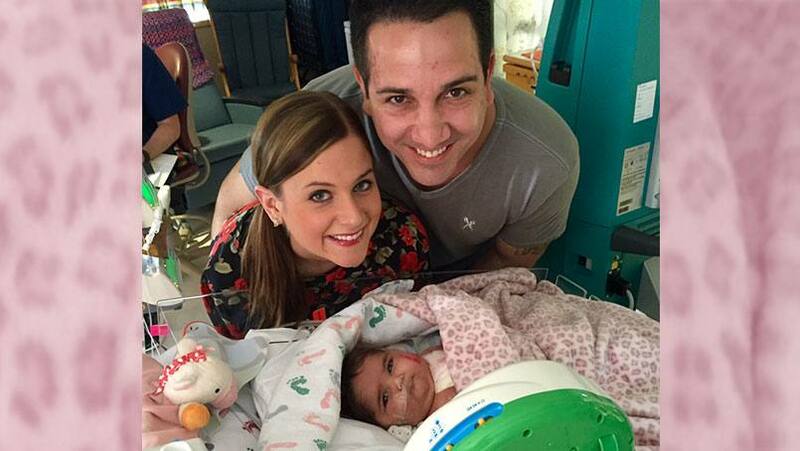 Katelyn and Jordan watched as their seemingly healthy newborn daughter was put on a ventilator and prepped for a balloon valvuloplasty procedure, in an attempt to widen her aortic valve. "She was born with aortic valve stenosis, which is narrowing of the aortic valve in her heart," Katelyn tells us. Open heart surgery followed. "A couple weeks after her surgery, her X-rays were not good," Katelyn tells us. "They were actually looking worse." Jett's doctors referred the family to Jonathan Johnson, M.D., medical director of Mayo Clinic's Pediatric Heart Transplant Program in Rochester. "He (Dr. Johnson) drove up to Minneapolis to meet with us," Katelyn says. "He spent an hour and a half talking with us and answering any questions we had." As he left, Dr. Johnson told Katelyn and Jordan that he'd take Jett's case back to his colleagues at Mayo to determine whether she'd be a candidate for a heart transplant. "It was her last option," Katelyn says. The following day, Jett was transported to Rochester by helicopter. "Twelve days later, she had to go back on life support, and her ECMO (heart-lung machine) has been keeping her alive ever since," Katelyn says. "So now we're just waiting for a new heart." Given their experience, the Youngs are already thinking about the impact on the donor family as they await a life-saving transplant. When that day comes, they say they want Jett's donor family to know the value of that gift of life. "We'd love to be able to know more about the family," Jordan tells us, "so they can hopefully meet her and see that the child they lost will continue to live on through her." You can read more about Jett's transplant journey here. Then, share your comments below. You can use the social media tools to share this story with others. Jett is in GREAT hands with Dr Johnson!!! Hoping she is Happy and Healthy Very Soon!! !